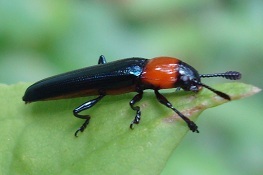 Genetic studies had suggested that the Lizard Beetle (Family: Languriidae) is in the same family as the Pleasing Fungus Beetle (Family: Erotylidae). However, some regard them as separate families. (1) James A. Robertson, Joseph V. McHugh, Michael F. Whiting. A molecular phylogenetic analysis of the pleasing fungus beetles (Coleoptera: Erotylidae): evolution of colour patterns, gregariousness and mycophagy. 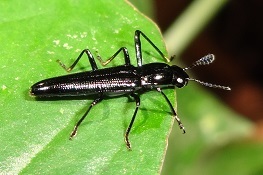 Systematic Entomology 2004;29(2):173-187. (2) Leschen, R.A.B. Erotylidae (Insecta: Coleoptera: Cucujoidea): Phylogeny and Review (Part 1). Fauna of New Zealand. Fauna of New Zealand. Manaaki Whenua Press, Lincoln, New Zealand. 2003. (3) Leschen, R.A.B. & Wegrzynowicz, P. Generic catalogue and taxonomic status of Languriidae (Cucujoidea). Annales Zoologici 1998;48:221-243.